This review originally ran in the Friday August 16th issue of Shelf Awareness for Readers. If you don't already subscribe, sign up here to receive a bi-weekly dose of readerly goodness in your inbox. 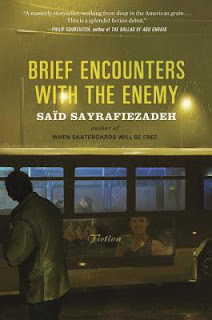 Brief Encounters with the Enemy, a collection of linked short stories from Said Sayrafiezadeh (When Skateboards Will Be Free), centers on a nameless American town at war with a nameless enemy. Sayrafiezadeh's stories follow the natural arc of war, starting with allusions to the war as something that could happen, shifting to something that will happen and finally to something that is happening. Though it is tempting to try to identify the city and the enemy, the anonymity of both ultimately works to Sayrafiezadeh's advantage. With the exception of "Brief Encounter with the Enemy," in which a soldier recounts his boredom with the war, his misguided reasons for enlisting and his first--and only--encounter with enemy forces, none of these stories depict the war itself. It's the people affected by the war who are the focus, from the amateur cartographer who struggles to find work in an uncertain economy to the illegal immigrant stressing over deportation on a daily basis and the call center employee who watches jealously as his co-worker is celebrated for enlisting. The stories tell of a world rocked by war and steeped in uncertainty. Through it all, though, regular, daily life keeps ticking along: workers still ask for raises, men still try to get laid, people still look for better work, shoplifters still shoplift. Sayrafiezadeh's collection skews heavily toward a masculine perspective, but still manages to capture the simultaneous enormity and normality of a country at war.